Your first step to regaining your health and recover your life at Windward Way begins with an assessment to determine how our medically supervised detox will proceed. Since many addiction types require a different regimen for treatment, you may rest easy that you will receive only kindness and compassionate care as you detoxify your body from drugs and/or alcohol. Windward Way employs the highest standards for an alcohol and drug detox to ensure a safe and appropriate transition to the next phase of your alcohol and drug rehab. You see, we’ve developed our entire continuum of care specifically to reach men aged 18 to 45. Since we know how difficult the process can be to find lasting recovery, we want to give you the absolute best chance at finding success. Windward Way’s experts can craft these first steps to gently allow your body to heal before you enter our core treatment program. Do yourself a favor—take a moment to reach out and speak with our intake pros. You’re about to recover your life in a big way—the Windward Way. 855-491-7694. 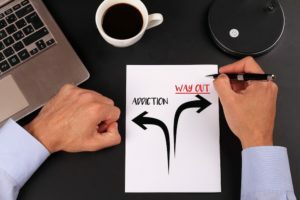 What Are the First Steps to Addiction Treatment Recovery? The first and perhaps one of the most difficult steps to recovery is admitting your problem and looking for help to overcome it. For some, this process is more comfortable and doesn’t pose that many challenges. But, for most people, recovery is long, complicated, and full of temptations. A lot of factors can influence rehabilitation such as the type of substance abused, family history, and demographics. With the right guidance, these people can conquer the first steps to addiction treatment recovery. An intervention is a purposeful process that the addict’s family and friends organize under the guidance of a professional. This process aims to help people who struggle with substance abuse to come to terms with their affliction and consider the necessity of treatment. During the intervention, the family describes the long-term consequences of abuse and presents the patient with multiple options for recovery. When a person stops using a particular substance, whether it is alcohol or drugs, they may undergo extreme physical and psychological symptoms they can’t handle on their own. Through medical detoxification, trained staff safely manages withdrawal by providing medication to alleviate symptoms or teach the body not to crave the abused substances. Medical detoxification alone is only the first step of recovery, as it can’t be sustained for a long time. It must be followed by behavioral therapies, such as individual or group counseling and changes in the patient’s lifestyle to be effective in the long run. What Treatment Program Is Best? Depending on how severe and lasting the substance abuse is, several treatment options may be used either sequentially or at the same time. Long-Term Residential Treatment: The patient lives in a treatment facility for extended periods of time (6 to 12 months) and follows a complex program meant to socialize them and help them develop personal accountability and responsibility. Short-Term Residential Treatment: This therapy starts with a 3 to 6-week initial stay in a specialized residence, followed by an extensive outpatient program to prevent relapse. Outpatient Programs: For some patients, outpatient programs are necessary from the beginning. Their intensity varies between pointed drug-abuse education and intensive day treatment to group counseling. To understand which treatment program is best suited for the patient, experts conduct an initial screening and assessment that clarifies what happens next and how important the cooperation between patient, family, and the clinic is. Screening for suicidal tendencies, possible violence, and associated diseases or conditions is also vital at this stage of the recovery process. Case Management: A professional is in charge of the patient’s well-being after the program is over. They can be essential for reintegration and provide crucial services like finding healthcare specialists, housing or giving guidance. Counseling and Therapy: Whether as part of individual, family or group sessions, these therapy methods are vital for providing patients with the support they need to continue on the path to recovery. Family Education and Counseling: These therapy sessions are necessary to prevent patients from going back to the old habits that led to addiction in the first place. Admitting that you need help and reaching out to your family for their support can be difficult. However, this first step can be the beginning of a new and better life.